YardEdge welcomes new guest blogger, Karen Hutchinson, who reviewed the recently held show presented by Women’s Media Watch. The audience of the annual Gender Fever surely felt their temperatures rise as they watched, participated in, and were entertained by the Women’s Media Watch (WMW) show staged on Sunday, June 7. The venue was Weekendz, the theme “Breaking the Silence, Healing the Wounds”. 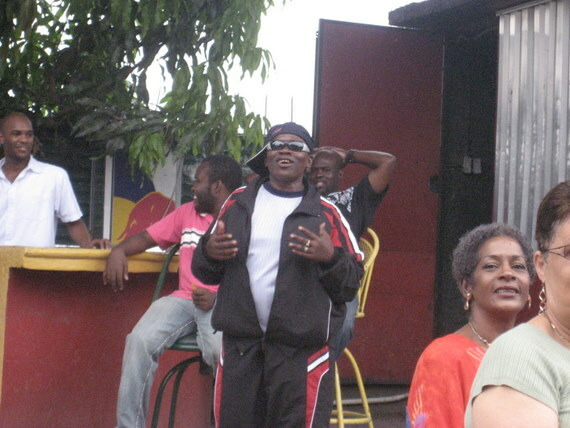 In addition to the spark offered by the very important and controversial issue of gender relations in modern Jamaica, the flame of performers such as Afolashade, Taitu Heron, Mel Cooke, Cherry Natural, and Courtney John burned so brightly that the audience seemed to catch some of the fire. The show, which was divided into three segments, began with a brief musical interlude from Mbala on drums and Pappy on horns. WMW Officers Afolashade and Hilary Nicholson set the tone for the show with a fun interactive skit depicting an unaware sexual harasser “Clarkey” (Afolashade) and one of his victims “Miss Brown” (Nicholson). Afolashade changed roles throughout the course of the night switching from Clarkey to the intermission tour guide on the WMW history trail, pointing out the evolution of the Association which is now 21 years old. Like WMW, the Sistren Theatre Collective sprung from a Bureau of Women’s Affairs initiative and Sistren were also represented by an excellent and memorable reading from Lana Finikin. Ms. Finikin read from Lionheart Gal: Life Stories of Jamaican Women about a 6 year old being raised by her grandmother and meeting her father for the first time. The other grandmother of the evening, the one presented by Mel Cooke, was an interesting depiction. Reading from his published collection of poems, Mr. Cooke presented the insightful Family Games and Breed. Mr. Cooke prefaced the reading of Family Games by explaining that he believes that many matriarchs infect their children with abuse because they were themselves infected by their own parents. The grandmother in the poem is playing hide and seek with her grandchildren. It appears that the passage of time has softened her. While her own children were perhaps more likely to receive her open palm her grandchildren know only a loving side. The poem Breed also dealt with issues of family and child rearing but from different angle. The poem refrains “mi know man tie woman with a one spite breed” and speaks to how men use their power to impregnate women and thus create a never ending bond in the person of the child. Mel Cooke perhaps was one of the more low-keyed poets of the evening. Taitu Heron, introduced as ‘civil servant by day, poet by night’ added a touch of performance to her reading. With a woman pouring libations for the departed down stage right, she sat centre stage in her skirt with legs symbolically wide apart boldly telling the stories of several women who throughout the ages have lived and suffered in Jamaica. The performance, while welcome was not necessary, as the poem itself had real power. 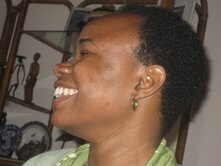 The women and their stories stretch back from slavery through to modern 21st century Jamaica and the words “I am a woman, a long existing woman, whose spirit wants peace” point to the connection between the women and highlights the fact that the difficulties they face have not ceased with the march of time. Another bold female poet to take the stage was Cherry Natural who ultimately had the audience ablaze with her poem “A Warrior Love Song” which described a strong woman’s desire for her lover to be. Blacka Ellis like Ms. Heron had assistance on stage with his reading and enlisted the help of two dancers, Stacia Fire and Joel Ellis. Displaying his poetic side, he had the audience intoning “Tick Tock” to the poem with the same name. Michelle Golding of WMW read a poem dealing with violence against women while Georgia Love performed the poetry of Yanique, an older woman with a sensuous side. Jean Lowrie-Chin read two poems from her recently published collection Souldance, “You See Me” and “Your Son Too (For Lee Boyd Malvo)” which looked at how men in our society can go astray. The Hannah Town Cultural Group dressed in red and black dub-poetically placed the responsibility for doing more to solve the crime problem on the shoulders of the women in communities. 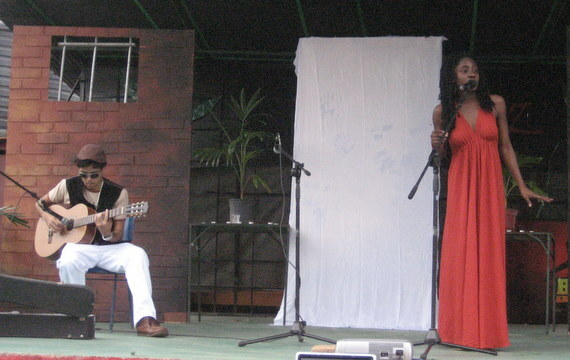 Mbala and Pappy were back on stage to perform poetry set to music and delivered pieces such as “The Woman with the Big Fat Bottom” and “The Tender Love Song of the JA Dancehall Artist”. Mbala, Pappy, and Mutabaruka, whose selections provided the backing tracks for an enjoyable night, were not the only ones to bring music to the patrons. Early in the show the audience listened to the original songs of Janine Cunningham accompanied by Jason Worton. Dressed in a slinky red to the floor dress, she belted out in jazzy bluesy flavour “Gone is the Day” which told the stories of three women, and “Invincible”, with Jason coolly strumming the guitar. It was another singer Courtney John who closed the show, twice, as the crowd was so enthusiastic he did a brief encore. His falsetto voice had the audience excited particularly when he sang a cover of Marvin Gaye’s “What’s Going On” following original tunes “This Love” and “Miss You”. Running through the poetry and the songs was of course the message that the so-called battle between the sexes really is a major struggle. Yet, as was pointed out early in the night, gender issues are not about women’s issues, they are about the issues of both men and women. Here’s hoping that the good vibes spread by the lyrical evening in addition to the work of the WMW will have an impact on cooling the tongues and the tempers of the men and women in our Jamaica. Karen likes to do the unexpected. There is no other explanation why this one time Investment Trader and Business Analyst is now content to write fiction as well as analyse and comment on the fiction of others. Karen is a a contributing writer to the Sunday Observer’s Bookends Magazine and a partner in the only Retirement and Employee Benefits Consulting firm in Jamaica. She received her MBA in Barcelona, Spain at IESE and is now pursuing a degree in Literatures at the University of the West Indies.